Last week, I made some pancakes for lunch. Not the small, round, puffy American kind: the German, flat, crépe-like kind. They weren’t 100% vegan, as I used a real egg, but could easily have been made vegan by using a flax egg instead. I won’t post a recipe for those pancakes today, any crépe recipe would suffice. 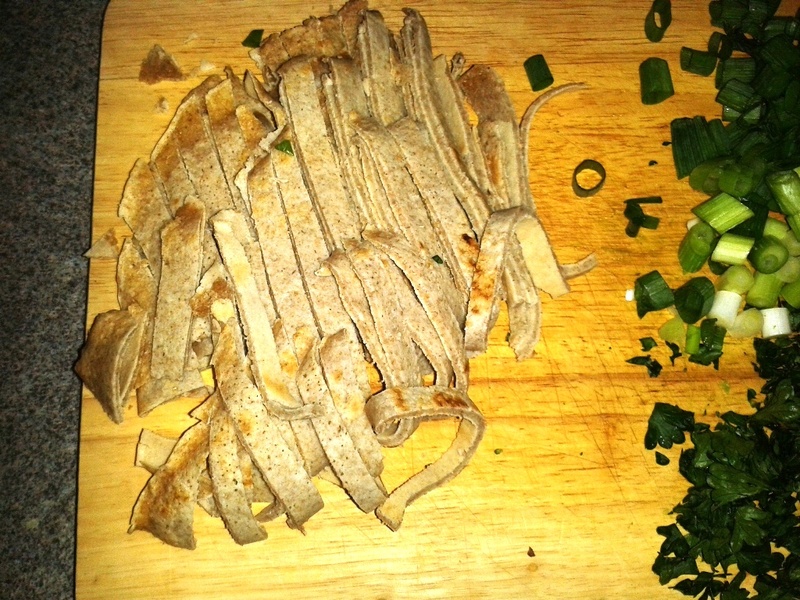 Besides, today isn’t about the pancakes, it’s about what I did with the left-overs! 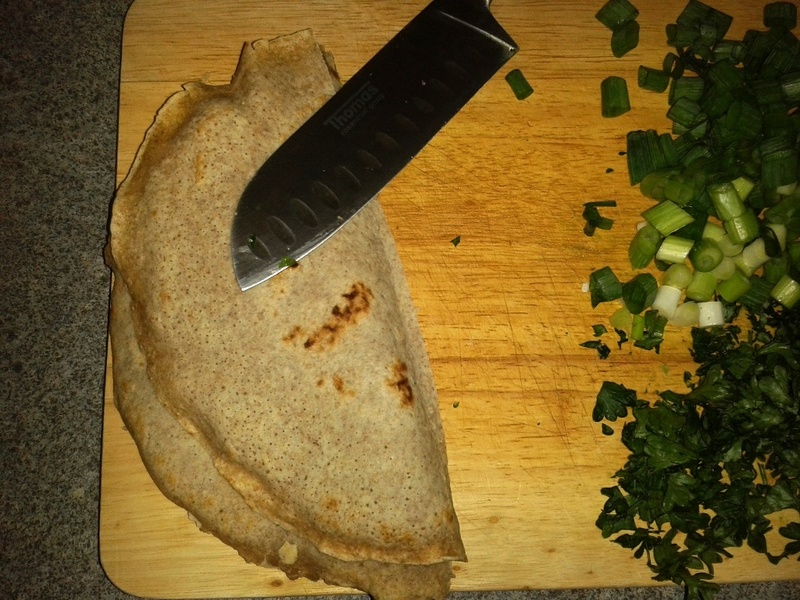 Update: I have now posted a crépe recipe, check it out! When I was a kid, I absolutely adored pancake soup. Never heard of it? It’s a basic veggie soup with fresh cilantro and pancakes cut into striped – aka striped pancake soup. Which probably explains why I loved the soup as a kid. I mean, who wouldn’t like pancakes for dinner? (Even if in this dish, they are savory). 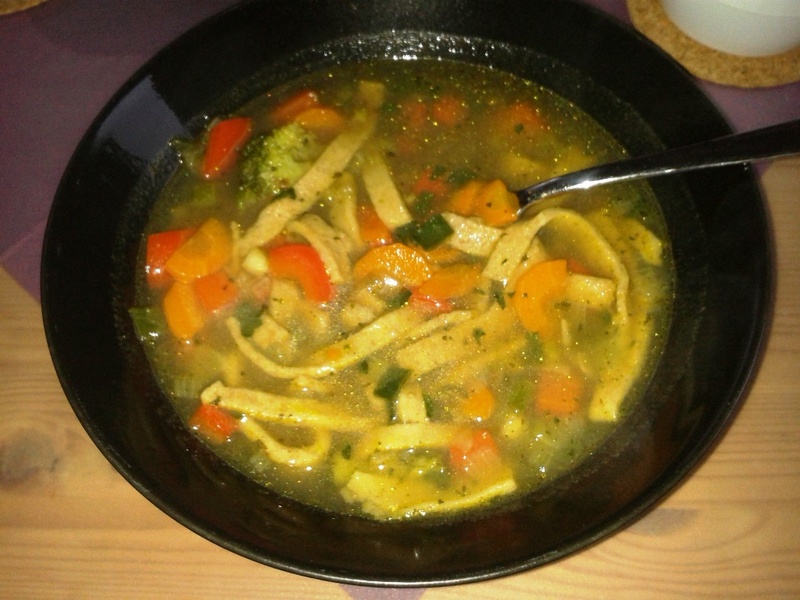 I just wrote “basic veggie soup”. See what’s wrong with that description? 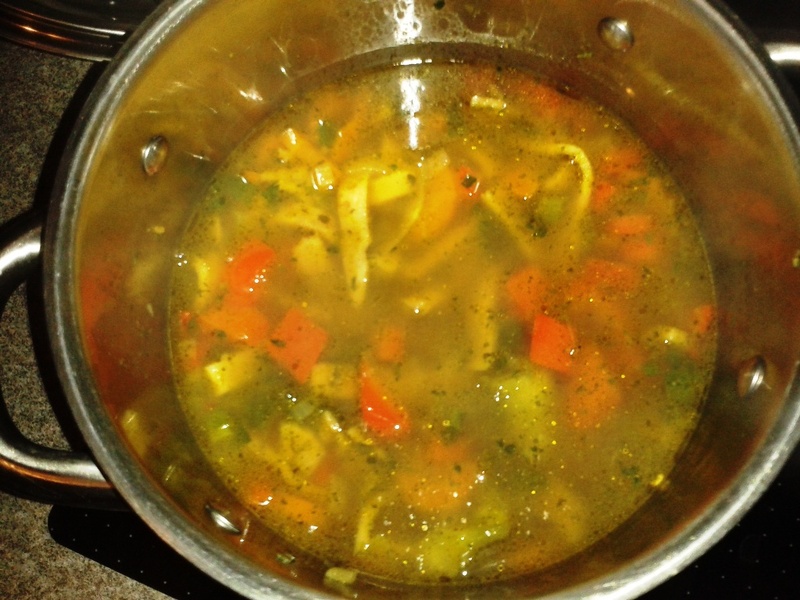 I have struggled with making a great veggie soup for years. Whenever I made veggie soup, I always felt like something was missing, like a hint of spice was lost somewhere along the way. Not today, not with this soup! 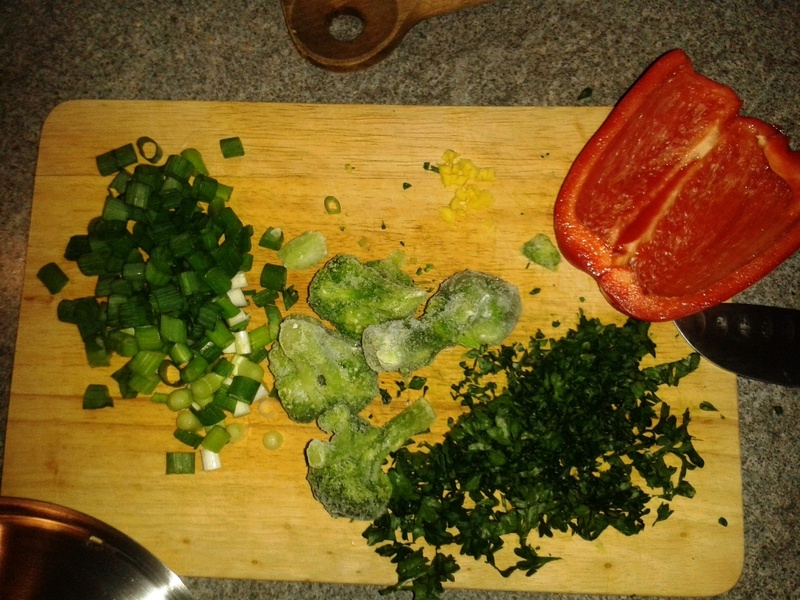 I am proud to announce my “secret” ingredients that make a simple veggie soup a perfect dish. Granted, the pancake stripes kind of take it over the top, but the soup without the pancakes is pretty awesome already. This dish is completely vegetarian and vegan (if your pancakes are vegan, that is). It is also a great way to incorporate lots of veggies in one simple dish! I chose some carrots, broccoli, red bell pepper, and cilantro, making this a “rainbow” dish at its finest! I love when food is that colorful. Prepare this one day ahead, as it will become even more intensely tasty if you let it sit! 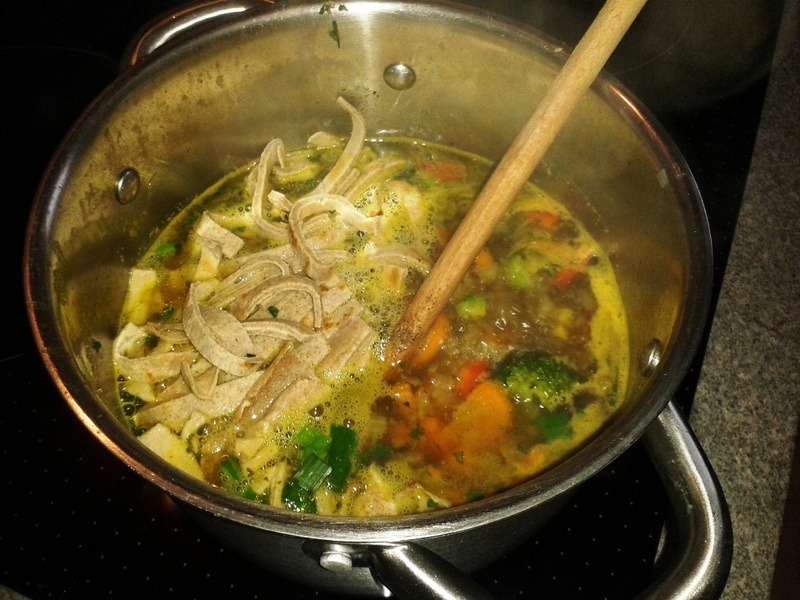 The pancake stripes will really soak up the spices, and the veggies will add so much taste to the “simple” broth. 1. In a small pot, heat the olive oil, and sauté the diced onion (not the green onion). 2. 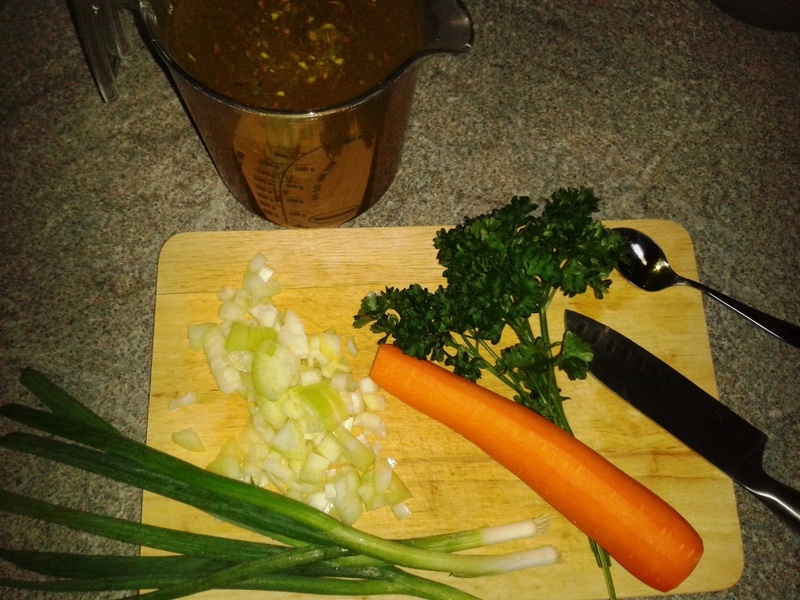 Once they start to turn brown, add the broth, and then add the diced carrot, diced bell pepper, and the broccoli. 3. Bring to a boil, then cover with a lid. Allow to boil for 10 minutes. 4. Add the green onion, cilantro, honey, soy sauce, and lovage. Lower heat and allow to simmer for another 5 minutes. 5. Cut the pancake into stripes, then add to pot. Continue to allow to simmer. 6. If preparing beforehand, keep in the fridge until serving. Otherwise, turn off the heat and keep on the warm plate for another 10 minutes (at least). The longer you allow it to rest, the better it will taste! 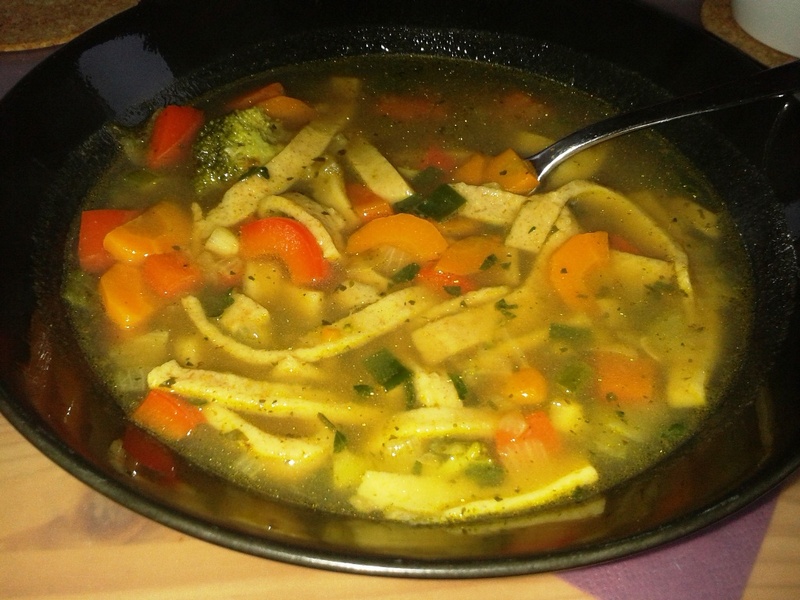 Enjoy this nostalgic, flavorful, rainbow-colored soup, rolled up on your couch. remembering the “good ole days”! BTW: This is post number 100!!!! That’s a really creative idea! Soup and pancakes are like, my two favorite foods, so combining them in genius! Pancakes and soup is actually quite common here in Germany, and I agree, it’s pretty awesome. I hope you enjoy making it (and eating it, of course).